LNG cargoes from U.S. headed for China, Japan, South Korea, Taiwan and Southeast Asia require transit through the newly expanded Panama Canal Neopanamax locks to cut their journey by a month. In the last two years, 84 percent of U.S. LNG bound for Asia has transited via the canal. U.S. LNG transiting the Panama Canal to reach Asia not only saves voyage time, but also money. Despite the approximately $300,000 toll fee charged at the Panama Canal for a 160,000 cubic meter LNG tanker, using the canal will always save money if the ship is headed for Asia. The bulk of the savings comes from reduced charter expenditure due to the difference in voyage time between the canal transit route versus the longer way around the Cape of Good Hope. LNG rates are expected to average $70,000 per day in 2019. At this level, the canal saves about $0.79 per million British thermal units. At an LNG charter rate of $190,000 per day — a level seen a few months ago in the spot market — using the Panama Canal saves nearly $2 per million British thermal units on the trip. The canal’s limited number of slots — or vessel transit permits — per day can be a constraint for LNG tankers during peak demand periods. In the 2017-18 winter season, when the Asian Japan-Korea Marker (JKM) LNG spot price was above $10 per million British thermal units, more cargoes traveled through alternative routes to get to Asia. This winter, when prices were weak in Asia, less U.S. LNG found its way to the region. Much of it was channeled to Europe as the price arbitrage opportunity in Asia was largely limited, and shipping costs were high. 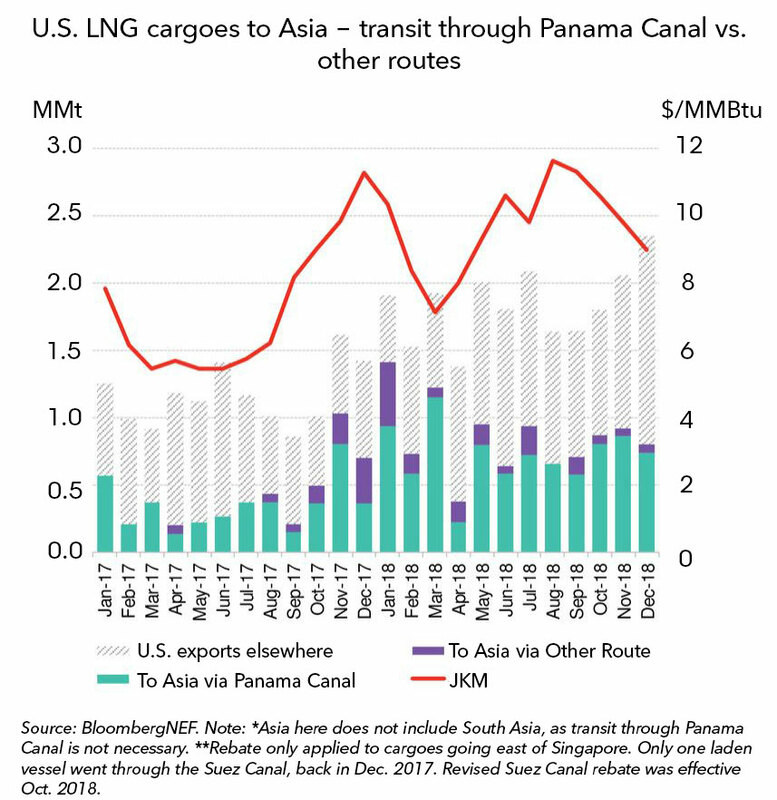 BNEF clients can access the full report, Panama Canal Vital for U.S. LNG Reaching Key Asian Markets, on the Terminal or on web.